Our Vision: Concentrating 100 percent on improving our profitability in crypto mining in the most secure way possible. Quake Mining is a pioneer in crypto mining. We elaborate a mathematical solution that will make token holders receive dividends for life. We are located in Quebec, Canada where electricity cost is very cheap. We will have an access to green energy, benefit from political stability and cold weather most of the year, will cool our equipment. Our chief miner is mining since 2014, we rely on his experience to give us the best result possible. We will always buy the latest and best crypto mining equipment to always be on top of difficulty. We will diversify in GPUs and ASICs for the best long-term result. Quake Mining is Canada based company which is running its mining operation in Quebec Province. This is a cold region with low cost of electricity and fast internet which make it extremely suitable region for cryptocurrency mining. Electricity in Quebec is cheapest in Canada. The cost of electricity for Quake Mining in Quebec is just 2.4 cent USD per KW/h which makes company’s mining operation more economical. 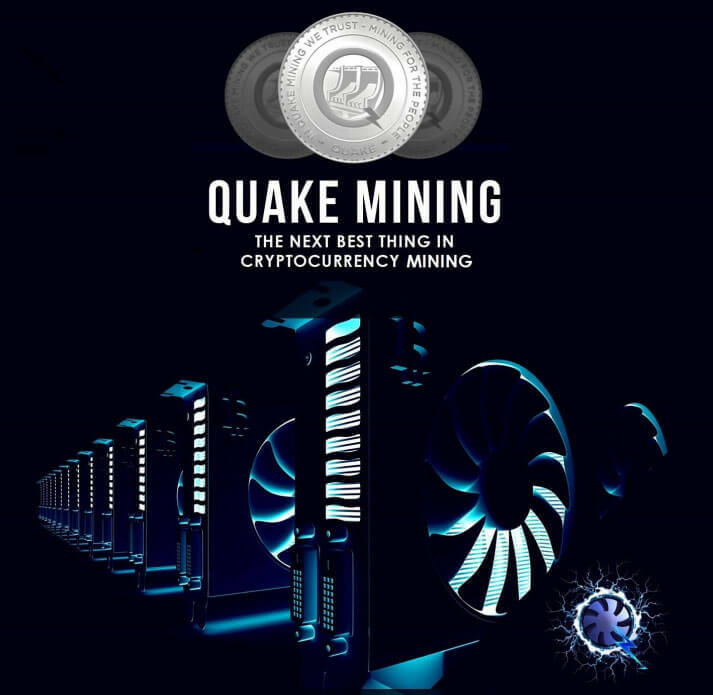 Quake Mining has the vision to become one of the biggest and most profitable mining companies in the world. It has a streetsmart team, innovative plan, strategic location, updated tools and commitment professionals to make its vision come true. Quake Mining has decided to launch its token to get resources for its project. All token holders will get mining reward every week according to the number of tokens they are holding. In this way, token holders will not only have their investment in their hand in the form of our token and they will also enjoy reasonable profit on their investment. As the mining operation of Quake Mining will expand the value of token will also increase. 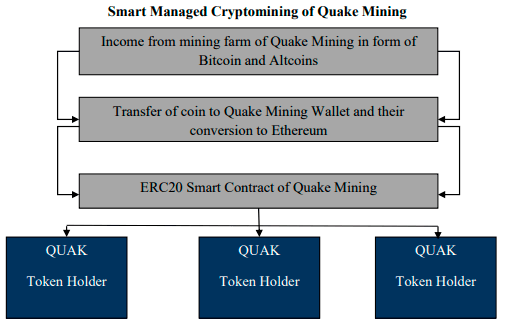 Quake Mining is launching its own token (QUAK). The token holder will get a share of mining rewards according to the number of tokens they hold. Any person can get QUAK token through Bitcoin, Litecoin, Dash, or Ethereum. Since our token is ERC20 therefore investors will be able to hold QUAK token in any ERC20 compatible Ethereum wallet like MyEtherWallet. Quake Mining is using Proof-of-Work (PoW) algorithm and SmartWare software to make its mining operation more profitable. SmartWare is custom built software which will enable Quake Mining to scan crypto-mining market to find out which coins are most profitable to mine. We will adjust out equipment accordingly. SmartWare will analyze coin on the basis of their price, difficulty factor, exchange rate, hash algorithm and our mining equipment. We will transfer all our mined coins to Quake Mining Wallet and then switch all of them to Ethereum. After this conversion Ethereum coins will be distributed to the token holders every week with the help of our smart contract and Quake Mining refer this process as “Smart Managed Cryptomining”. We are also developing a decentralized app (DApp). Users of this application will be able to overview our mining operation coin value, mining capacity and individual earnings, different coins mined, rigs’ status, rewards, hash rate etc. In this process every token holder will automatically get his share of mining rewards automatically and transparently. Idea and ResearchIdea and research on the feasibility of the project. Collected Main Points and organised the facts and figures. Development, Getting ReadyDevelopment of Website, Platform, WhitePaper and Smart Contract. Just getting ready to gather things around. Pre-ICOPre-Sale of tokens will start on May 1st, 2018 at a special price prior to the ICO. Launching ICOICO will start on May 16th, 2018. The Token remaining from the sale will be burnt. End of ICO, Legal, Research, Exchange ApplicationLegal, Extensive Research on the latest improvement of technology on the market, meeting with crypto mining manufacturer, then order the best mining equipment available with the best deal. Exchange listing application. Installation of New Mining EquipmentInstallation of New Mining Equipment as we receive it. First PayoutsThe first Payout to the token holders will be paid automatically by our system in November 2018. Buying New EquipmentWe will buy new equipment twice a year with the 25% of the mining proceeds we put in reserve every month to increase our mining capacity constantly. Construction of our own Facility With the 1% of the mining proceed we accumulate in reserve, we will build our own facility with full solar capacity with the most recent development in this space to increase efficiency.